Guess this is Maserati's way of saying sorry for taking so long with the Alfieri? Those poor bastards that worked on the Maserati Alfieri must be feeling like they got gypped right about now. In all likelihood, they were given a good pep talk and paid a large sum of cash to draw up something as beautiful as the Alfieri, but it seems unlikely that the concept will see the open road in production form now that Maserati has placed it in a state of perpetual delay. Not all is lost, however, because the Alfieri will live on plastered on the face of the 2018 GranTurismo. The CEO of the Trident-badged automaker, Reid Bigland, took to the New York Stock Exchange to ring the bell signaling that the markets have closed for the day in order to introduce the facelifted grand tourer. Considering this is the last year that the current GranTurismo will be in production before it’s replaced by a new body style, ringing the closing bell as a form of introduction is a metaphor of sorts. But just because the GranTurismo is on its way out does not mean that Maserati slacked on the redesign, especially when considering that new pretty face. 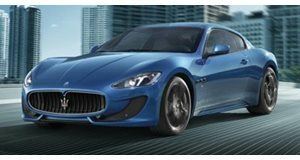 A “sharknose” hexagonal grille gives the front end more character without sacrificing the beauty and style that the GranTurismo is known for. The grille is also functional, improving air flow distribution while lowering aerodynamic drag from 0.33 to 0.32 with the help of the lower air ducts. Though the lightweight MC version will be on display in New York, Maserati will also sell you a Sport variant, both of which are equipped with the same 4.7-liter naturally aspirated V8 built by Ferrari in Maranello. At full tilt, it’s capable of 460 horsepower and 383 lb-ft of torque, enough for 0-60 mph to go by in 4.8 seconds in the Sport and 4.7 seconds in the MC model. Failing to escape the hand of change is the infotainment system, which is new for 2018 and looks good sitting in the rearranged center console. Hopefully this will hold off the Alfieri fans for now.